Oppositional Defiant Disorder or ODD is a behavioral disorder where the child shows continuing aggression, many outbursts, and irritates others. Any child can have ODD, but this disorder is far more common in children that have ADD or ADHD. Children with ODD (Oppositional Defiant Disorder) have tantrums far beyond a “normal” tantrum and respond minimally to authority and directions given to them. These behaviors are usually always directed towards the adult’s authority figures in the child’s life. Conflict will be something the child enjoys and thrives off of even though this conflict may exhaust them. 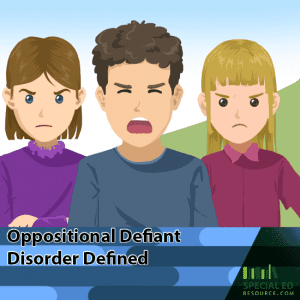 Girls that have Oppositional Defiant Disorder (ODD) may have different symptoms than boys. Boys with ODD have more aggression and explosive behaviors. A girl with ODD will typically have behaviors such as lying, and very passive aggressive behaviors. This disorder is usually diagnosed in early childhood. There is a chance that some children may move beyond the disorder by age eight or nine. This subset of ODD is present from an early age. If a child has childhood onset ODD, some interventions and treatments will help your child cope with this disorder may even stop the progression. This type of ODD will start in late middle school to early high school. If you notice a shift in your child’s behavior toward you and towards authority, there may be a chance that your child has adolescent-onset ODD. This form of ODD is less common but may become progressively worse, and the adult may develop an antisocial personality disorder. Even if the Oppositional Defiant Disorder does not worsen, it may cause problems with work and relationships. Treatment for adult Oppositional Defiant Disorder usually involves therapy and medication. Trauma can also cause a child to have oppositional tendencies. Trauma can be as severe as child abuse or as little as a childhood pet’s death. Each person sees traumatic event differently, yet these types of events can trigger ODD in some children. If you believe that your child has ODD, the first task is to consult with the child’s physician. The physician will then compile a family history, behavior history, and consult with close members of the child’s life. The child’s physician will more than likely have family members, teachers and other confidants close to the child complete a rating scale and questionnaire to have a complete evaluation. Before a child gets treatment for ODD, you first must make sure that the child’s related condition is identified and under control. ODD is most commonly treated with psychotherapy and medication for the child. Parents may also be advised to take parenting classes to help them understand ODD and how to support a child with ODD. ODD is not just when your child does not listen. It is a severe disorder that can affect your child’s ability to be a functional, productive adult in society. If you believe your child has ODD consult with your physician to get the help your child needs to cope and live with this disorder! Do you have experience with Oppositional Defiant Disorder? Please leave any feedback you have in the comments below! This entry was posted on Tuesday, March 26th, 2019 at 8:27 pm and is filed under Special Education Labeling and tagged as Special Education Behaviors, Special Education Labels. You can follow any responses to this entry through the RSS 2.0 feed.